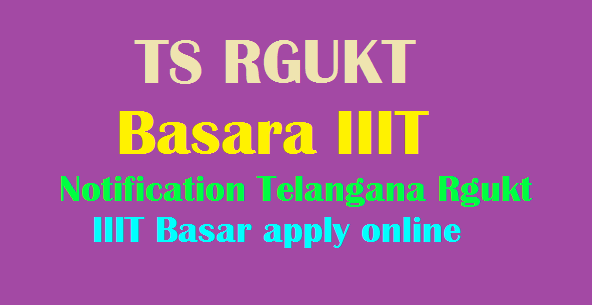 TS RGUKT Notification 2018 Online Application for Basar IIIT Admision : Basara IIIT notification 2018, TS Rgukt IIIT Basar apply online 2018 : The most awaited notification for the admissions in the Rajiv Gandhi University of Knowledge Technologies located at Basara had been released by Telangana IIIT Basara admission notification 2018. TS RGUKT Notification 2018 – Telangana State Basar IIIT Notification 2018 Online Application begin for TS RGUKT IIIT Notification 2018, IIIT Basar Admissions at www.rgukt.in. TS RGUKT Detailed Notification 2018 announced with complete schedule of Basar institute admissions online application start date with closing date of submitting the printout of the on-line application with the Telangana RGUKT Basar Admission Schedule 2018. The Rgukt had released the ts iiit notification 2018 on its website for the session 2018-2019. The notification clearly contained all important details, basar iiit application form 2018 last date, fee structure and iiit basar selected list pdf. To know the important details required to apply for the ts iiit admissions check below. Rajiv Gandhi University of Knowledge Technologies – RGUKT Invited applications 2018 from capable and interested candidates for admission to the first year of 6-Year Integrated B.Tech program at RGUKT Basar Campus Telangana State. The Basara IIIT admissions were open for the academic year 2018-2019. The Candidates can apply RGUKT IIIT Basar Six-year B.Tech integrated course Admissions through any Meeseva or Telangana Online Centers only, the Rajiv Gandhi University of Knowledge Technologies has announced there is no possible to apply in offline mode and online from RGUKT or any other private portal, every eligible student can apply through TSOnline and Meeseva Centers with paying above fee as per your categories and the service available across in the state as per schedule. After Successfully submitting the TS RGUKT IIIT Basar Online Application 2018 the candidate need to send the submitted application printout copy with attaching supporting document or certificates xerox copy’s to the RGUKT Basar Campus before last date, please note this very important to everyone, this necessary to every applicant to sent by post to RGUKT, submitted application printout copy with following certificates of student. బాసర ఆర్జీయూకేటీలో ప్రవేశానికి దరఖాస్తుల స్వీకరణ గడువును పొడిగించారు. పదో తరగతి ఫలితాల అనంతరం పునఃలెక్కింపు, పునర్‌మూల్యాంకనం పూర్తికాకపోవటంతో ఈ నిర్ణయం తీసుకున్నారు. జూన్ 1 వరకు ఉన్న ఆన్‌లైన్ దరఖాస్తుల స్వీకరణ గడువును జూన్ 4 వరకు పెంచారు. దరఖాస్తుల సమర్పణకు జూన్ 8 చివరి తేదీగా ప్రకటించారు. ఈ మేరకు విద్యాలయ అధికారులు గురువారం(మే 31) ప్రకటన జారీ చేశారు. 1) Fee Payment, and 2) Filling of the Application Form. Admissions to 6-Year integrated B.Tech Program Admission Schedule of TS RGUKT Basara IIIT for 2018-19 is as follows. Applied candidates can check their list of selected candidates in the official site http://admissions.rgukt.ac.in. The authorities will release the Basara Rgukt IIIT result 2018 2nd week of Jun 2018. Students can check their name in the Rgukt IIIT Basara selection list 2018. Candidates can check Basara IIIT notification 2018, TS Rgukt apply online, iiit basara admissions 2018-19, iiit basara website, iiit basara notification 2018, iiit basar selection list 2018, iiit basar results 2018, rgukt basar results 2018, rgukt basar admissions 2018 through this article.